Dominik Hašek, (born January 29, 1965) is a retired professional ice hockey goaltender that played a total of 16 seasons in the National Hockey League. During his playing career he played for the Detroit Red Wings, Chicago Blackhawks, Buffalo Sabres, and the Ottawa Senators. When he was in Buffalo, he became one of the league's best goaltenders. He was nicknamed "The Dominator." His strong play has been said to have establish European goaltenders in a league dominated by North Americans. Hašek was one of the league's most successful goaltenders of the 1990s and early 2000s. From 1993 to 2001, he won six Vezina Trophies, and in 1998 he became the first goaltender to win consecutive Hart Trophies. During the 1998 Winter Olympics in Nagano, Japan, he led the Czech national ice hockey team to its first and only Olympic gold medal. The feat made him a popular figure in his home country and prompted hockey legend Wayne Gretzky to call him "the best player in the game." 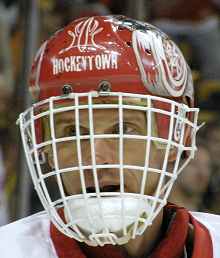 While with the Red Wings in 2002, Hašek became the first European starting goaltender to win the Stanley Cup. Doing that, he set a record for shutouts in a postseason year. He came in second in votes for the Conn Smythe Trophy for the playoff's Most Valuable Player. Hašek was considered an unorthodox goaltender, with a special style that has labelled him a "flopper." He is best known for his concentration, foot speed, flexibility, and unconventional saves, such as covering the puck with his blocker rather than his trapper. Hašek is seen as a future Hall of Famer by those in the hockey world. He is right now the oldest goalie in the NHL at 43, and also, the second oldest player in the league after Red Wings teammate Chris Chelios, who is 46. On June 23, 2014, Hašek was inducted into the Hockey Hall of Fame. ↑ "A to Z Encyclopedia of Ice Hockey". The Ice Hockey Annual. Retrieved 2007-01-09. ↑ 6.0 6.1 "Dominik Hasek (1990–present)". hockeygoalies.org. 2007. Retrieved 2007-04-24. ↑ "Hasek, Modano in Hall's Class of 2014". Detroit Red Wings. Retrieved 2014-10-19. This page was last changed on 31 August 2017, at 00:31.